It is important to know the difference between deleting an Instance from the Provisioning section, and deleting a VM from the Infrastructure section. Instances are managed resources that may have one or multiple Virtual Machines associated. Since the vm’s in the Instance are managed by |morphues|, deleting an Instance a with Virtual Machines in it will always try to delete the actual Virtual Machines. The Instance needs to be deleted, but the actual Virtual Machines need to remain. The actual Virtual Machines have already been deleted outside of Morpheus, so only the records in Morpheus need to be removed. Navigate to the Virtual Machine record by clicking on the VM’s name in the Virtual Machines section in the Instances details section, or by navigating to Infrastructure - Hosts - Virtual Machines and selecting the VM. Ensure “Remove Infrastructure” is NOT checked if you do not want to delete the actual Virtual Machine. Deleting a managed resource outside of Morpheus is not recommended as it will leave stranded record in Morpheus and cause deleting the records in Morpheus to get stuck on delete when Morpheus tries to remove infrastructure that is no longer there. Ensure “Remove Infrastructure” is NOT checked. If it is checked, Morpheus will try to delete the actual VM, and since it is not there anymore, the delete will not complete successfully since Morpheus will not be able to verify successful deletion of the Infrastructure. The key point is when deleting an Instance, or when selecting “Remove Infrastructure” when deleting a VM record, Morpheus will always try to remove the Infrastructure. 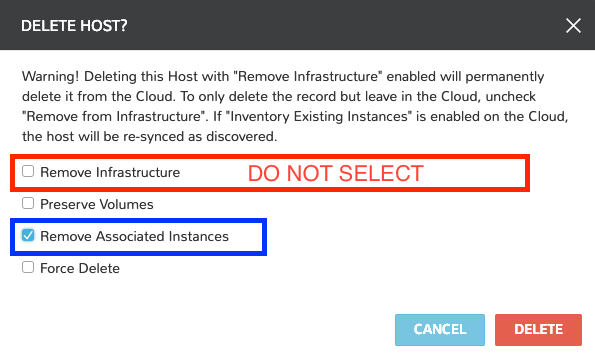 If the Infrastructure/VM no longer exists, or you do not want to remove it, simply delete from the Infrastructure section and uncheck “Remove Infrastructure”. When deleting a managed VM, if that VM is the only VM inside the associated Instance, the Associated Instance must also be removed.